9 inch Wide x 150 Foot Roll, Standard Grade Asphalt Coated / Saturated Cotton Fabric. Made in USA. 4 Rolls/Case. Price/Case. Asphalt-saturated cotton is traditionally used for hot-process coatings; it's easy to use, conforms to most products, and is often the choice of the seasoned pro. Asphalt coated cotton fabric is useful for roof repairs, flashings, parapet walls, coverage of entire roof areas and for waterproofing of building foundations, retaining walls, and wherever construction is exposed to the elements. Uses include stripping joints and flashings, roof repairs, and weed control. 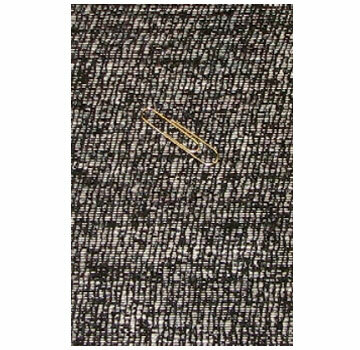 A uniformly distributed cotton fabric consisting of continuous cotton yarns woven perpendicular to each other and coated with an black oxidized asphalt binder. Cotton has had the longest successful application record of any reinforcement fabric. Compatible with both hot and cold (liquid) applied bitumen coating systems. Unrolls and handles easily without distortion or wrinkles for a quicker higher quality installation. Provides added reinforcement to blister and split repairs. The open mesh construction of the asphalt cotton fabric allows the surface coatings to penetrate through and interlock, thereby providing a firm mechanical bond between coatings, and insuring long life of the application. This strong elastic interlocking system is very pliable and prevents rupture due to expansion and contraction of the applied surfaces. Can be torn by hand for easier application.